I don’t know if it’s right to be too hard on the British intelligence community, since on the whole, they’ve been a bit more successful than our own. And you have to keep in mind, Muslims, and presumably extremist ones, makeup a much larger portion of their overall population than we see in the US. Still, this is a pretty big failure, let’s not kid ourselves. BREAKING: BBC News told members of the public called anti-terrorism hotline warning about the #Manchester attackers views several years ago. Also, this guy was moving back and forth between Libya and the United Kingdom. That’s not good. Also, I don’t believe his father. Either he’s just trying to put himself above suspicion (since two of his other sons were just arrested as well), or else he was just terribly misled. 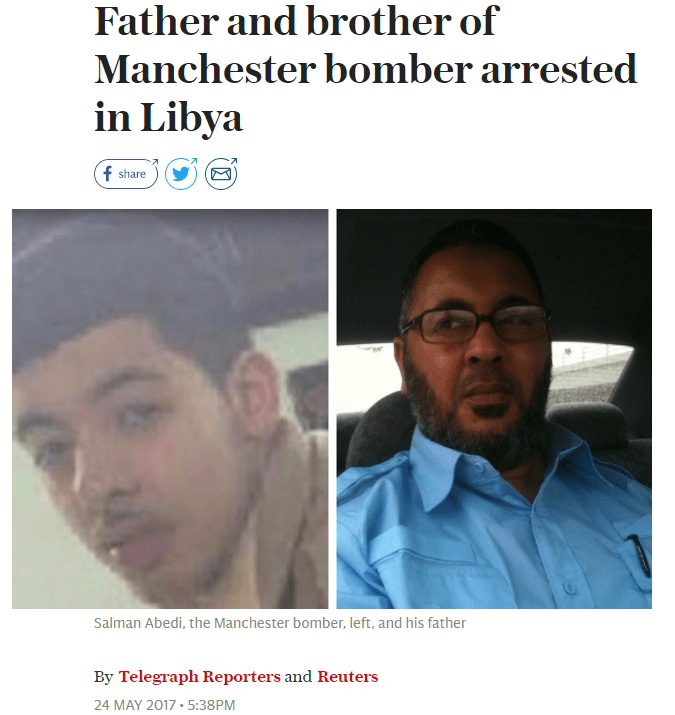 Suicide bomber Salman Abedi’s father Ramadan appears to confirm his son visited him in Libya, Bloomberg report. He said: “The last time we spoke, I told him he should come to fast during Ramadan with us in Libya, and he showed no objection. “If he had anything in his mind by that time he would’ve disagreed. Just hours before, Ramadan spoke of his disbelief of hearing the news of Salman’s involvement, insisting he was innocent. We’ll see what happens with all this. Even though the Brits seemed to have dropped the ball at first, at least they appear to be putting the pieces together at a rapid pace.